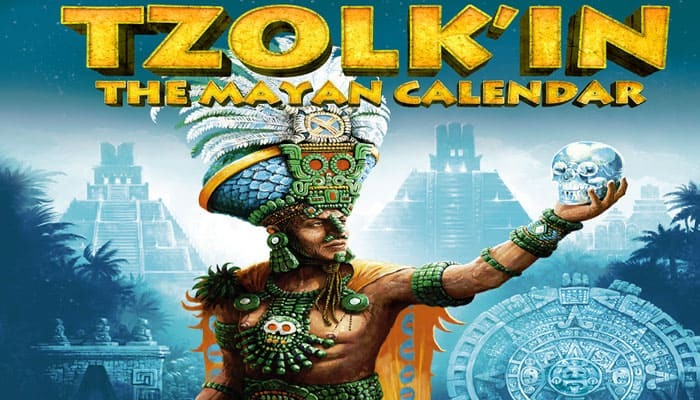 Tzolk'in: The Mayan Calendar is a dynamic worker placement board game in where players take the roles of one of the 5 Mayan Tribes (Palenque, Uxmal, Tikal, Yaxchilan, and Chichen Itza). The game board features a Mayan calendar represented by a 26-tooth Tzolk'in gear and depicts various actions that can benefit your tribe. On your turn, you will either place workers on the gears or pick up workers placed on a previous turn. The workers perform the actions when you pick them up. 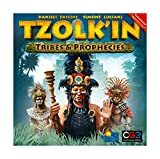 After everyone has had a turn, the Tzolk'in gear advances one day, causing all workers on all gears to move one position ahead, which changes the actions they can perform. Corn is the basic commodity, serving as food for your population and as currency. Actions allow you to produce food, extract resources, construct buildings, and develop technologies. Some actions please the gods, others displease them. You track your standing with the gods (Quetzalcoatl, Kukulcan, and Chaac) on the three temples on the board. The most devout tribes receive the best rewards. The gods award victory points twice during the game. You can also earn victory points by constructing certain buildings or carrying crystal skulls to Chichen Itza. The game ends after one revolution of the Tzolk'in gear. Your remaining resources are converted to victory points, and you also get points from certain monuments. Whoever has the most points at the end of the game is the winner. Place the assembled game board in the middle of the table. Lay the rest of the components on or around it as depicted.